The Toon Boom Process allows a machine to be a batch processing node for your network's vectorizing and render farm. Process runs in the background and checks the database's queue for any vectorizing or rendering job it could perform and, if it find any, performs them in the background. 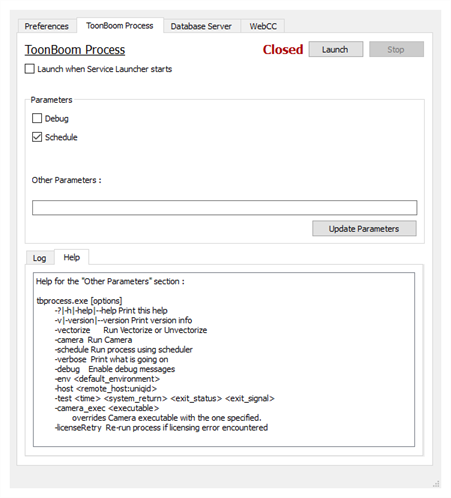 Launch when Service Launcher starts Check this option to automatically launch the ToonBoom Proces service when the Service Launcher is launched. This bypasses the need to click on the Launch button. Output detailed information about the tasks performed by the process service to the log, to help debug any issue with the service. This option is checked by default. It is strongly recommended that you leave this option enabled. It runs the ToonBoom Process service using the scheduler. Help tab This tab lists all the available options for the ToonBoom Process (tbprocess).You can type these parameters in the Other Parameters field to customize the behaviour of the service.